Can Oleksandr Senkevych live up to his election promise of a fresh start for the south Ukrainian port city? It is mid-May 2017 and Mykolaiv Mayor Oleksandr Senkevych is holding his first town hall-style meeting with local residents. The gathering is taking place in one of the city’s many leafy park areas, close to the Soviet-era House of Culture and Construction. A crumbling Hammer and Sickle crest on the building façade looms over a crowd of a few hundred as Mayor Senkevych addresses a range of mundane municipal issues. He may still be relatively new to public office, but he is clearly an accomplished orator, engaging with the crowd and politely listening to complaints before offering up a stream of detailed answers interspersed with occasional humor. “That’s an excellent question,” he quips at one point. “Was that one of our people?” The crowd seems pleased with this genial approach. The assembled babushkas titter at his gags and mutter approvingly among themselves, with many shuffling off following gentle coaxing from the mayor in order to write down the specifics of their complaints at a nearby information booth provided for the occasion. All this is a long way away from the high drama and even higher expectations that accompanied Mayor Senkevych’s autumn 2015 election victory. Few gave the thirty-something IT entrepreneur much chance when he entered the mayoral race as the candidate for Lviv Mayor Andriy Sadoviy’s Self-Help Party. However, he was able to tap into a surprisingly large post-Maidan desire for a fresh start and secured an unlikely second round triumph over a widely fancied candidate who represented the city’s traditionally pro-Russian establishment. Mayor Senkevych’s election success was so unexpected that many in the media dubbed it “The Mykolaiv Miracle.” This miracle was possible thanks to the support of local activists who volunteered to help run an innovative multimedia campaign that focused on novelties like flash mobs and social media messaging. Finances came via crowdfunding and relied heavily on donations from the Mykolaiv SME sector. Young voters were among the specific targets, while Senkevych supporters lined the streets every morning with handheld signs in a bid to counter his rival’s dominance in outdoor advertising and print media. This was the one of the few municipal campaigns to gain momentum in the former Party of Regions strongholds of southern and eastern Ukraine. The Maidan spirit of 2014 has struggled to cross over into regions of the country that have traditionally voted for pro-Russian parties, and the local elections of late 2015 saw a string of old guard candidates returned to office. As the exception to this rule, Mykolaiv’s new mayor quickly became a symbol of the possibilities created by popular mobilization around an attractive and untainted candidate offering the tried and tested political panaceas of hope and change. More than one and a half years into his tenure as city chief, Mayor Senkevych faces the day-to-day challenges of delivering on his lofty campaign promises. He must do so while working with a largely unreconstructed municipal council dominated by representatives of the former Party of Regions, which has rebranded itself as the Opposition Bloc but contains many of the same old faces representing the same entrenched interests. “I cannot say it is easy. 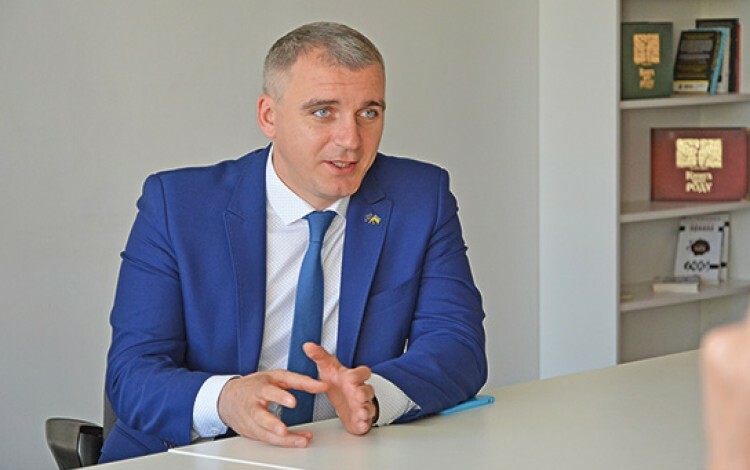 There is a political component to everything,” Mayor Senkevych tells Business Ukraine magazine when he sits down to talk to the publication in his spacious City Hall office. He sees room for guarded optimism in the progress achieved so far. His first attempt at agreeing an annual city budget in 2016 ran into repeated obstacles and ended up being almost half a year behind schedule. “2017 was better. We tried to seek consensus and identify shared interests,” he says. Mayor Senkevych believes the key task is to find common ground and not lose sight of the fact that beyond party affiliations, individual council members must also live up to their election commitments and demonstrate the benefits they bring to their constituents. He says his entrepreneurial background has proved particularly helpful in establishing a dialogue between rival political factions. “Our strategy is to introduce the business concept of win-win cooperation into the management of Mykolaiv. If we allow a situation to develop where my opponents block me and I retaliate by blocking them, then the ultimate loser will be the city itself.” He points to a recent unanimous council vote in support of an EBRD credit to overhaul Mykolaiv public transportation as an example of how municipal organs can function effectively when the city’s core interests are at stake. The other great obstacle Mayor Senkevych identifies is a mood of relentless negativity that he says infests the regional media and serves to sap the positive energy of the population. “If you do a Google search of news from Mykolaiv, you will find nothing but depressing information,” he reflects. 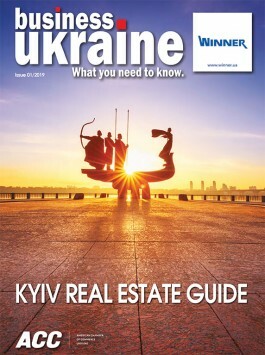 This debilitating trend is present throughout contemporary Ukrainian society, but Mayor Senkevych believes it is particularly pronounced in Mykolaiv due to the economic malaise caused by the decline of the once mighty shipbuilding industry, together with the presence of a plethora of politically motivated online information portals that vary greatly in journalistic quality. This tendency to see the downside of every situation makes Mayor Senkevych’s 2015 election win all the more remarkable. It also raises the question of whether disillusionment with the future direction of the city could lead to rising support for Kremlin efforts to detach the region for Ukraine. Mykolaiv was part of the large swathe of Ukraine targeted by Moscow during the failed 2014 “Novorossia” campaign that saw hybrid Russian forces attempt to spark insurgencies throughout much of southern and eastern Ukraine. While the city firmly rejected Kremlin calls to rise up against Kyiv, it remains relatively close geographically to Occupied Crimea and the ongoing conflict in eastern Ukraine. One of the key routes to greater prosperity is the attraction of international investment. Mykolaiv has recently excelled in this area, leading Ukraine in terms of international investment volumes in 2016 thanks to a number of major riverside port developments designed to boost the city’s agribusiness infrastructure capacity. In tandem with this influx of international investment, Mayor Senkevych says that the past few years have also seen a marked shift away from Russian markets as geopolitical necessity has forced local businesses to look further afield and broaden their horizons. “We are now seeing companies diversifying their operations and coming to the realization that we can manage perfectly well without Russia. The more international businesses we are able to attract to Mykolaiv, the more people will appreciate that we no longer rely economically on ties with Russia.” In order to make this happen, Mayor Senkevych says is ready to act as a lobbyist for any companies looking to invest in the city, and speaks with animation about the excellent human resources Mykolaiv boasts. “This city has grains and brains,” he offers.